The 124th session of the Committee of Ministers of the Council of Europe (CoE) was held in Vienna on the 6th of May 2014. The Georgian delegation which took part in the session was led by the Foreign Minister, Ms Maia Panjikidze. Among numerous priority issues, the main focus of the session was the current crisis in Europe. In the speech which she delivered during the session, Ms Panjikidze focused upon the difficult situation in Georgia's occupied territories. She gave her colleagues up-to-date information on the erection of barbed-wire fences and the digging of artificial trenches by Russian occupation forces along the line of their occupation, as well as on the gravity of the security situation and of the human rights violations in Georgia's occupied territories of Abkhazia and the Tskhinvali region. Ms Panjikidze noted that Russia's illegal actions discredit both the recent positive dynamics of co-operation in the spheres of economy and culture as well as the constructive measures the Georgian Government has taken in terms of normalizing relations with Russia. 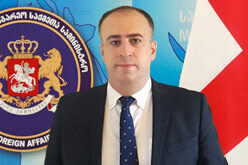 The Georgian Foreign Minister also underlined the fact that, despite Russia's provocative actions, Georgia adheres to the principle of peaceful and constructive co-operation. Ms Panjikidze, in her speech, also reaffirmed the importance of the Geneva International Discussions; expressed her Government's support for Ukraine's territorial integrity and sovereignty; and called upon the international community to take relevant measures in order to overcome the crisis in Ukraine in a timely manner. As the Georgian Foreign Minister underlined, the international community is once again, since 2008, at a crossroads of historical development, one where Europe is faced with the danger of confrontation and the principle of peaceful co-existence is no longer guaranteed. In conclusion, Ms Panjikidze thanked Austria for the important work carried out during its chairmanship, and welcomed the fact that the chairmanship of the Committee of Ministers of the Council of Europe will be handed over to Azerbaijan. In their speeches, the Foreign Ministers of the Council of Europe's member states discussed the urgent need to overcome the current crisis in Ukraine, and called upon Russia to take effective steps to de-escalate the situation. In this context, the British, Estonian, Romanian, Lithuanian and Latvian Foreign Ministers, as well as others, expressed their support for Georgia's territorial integrity and sovereignty, called upon the Russian Federation to respect the principles of international law, and underlined the importance of the need to use relevant mechanisms within the Council of Europe. It should be noted that, at the beginning of the session, the Committee of Ministers unanimously adopted its agenda and formally approved a decision, adopted before the meeting by the permanent representatives of the member states, on the situation in Georgia's conflict zones. The Ministerial also adopted a decision to take note of the consolidated report of the Council of Europe's Secretary General.